One of my favorite parts of fall are all the wonderful winter squash available at the farmer’s market. They are beautiful, delicious and can be made in so many different recipes. I think my favorite winter squash though is the butternut squash. The flavor is incredible, especially when roasted. For this soup, I’ve added lots of spices. Curry powder, masala, and smoky cumin make this soup irresistible. To balance out the spice, I also added sweet coconut milk and a few sweet carrots. The coconut milk also adds an incredible creaminess to this soup, perfect for a cool fall evening. For this soup, I tried out a new pot from Anolon. It’s part of the Anolon Nouvelle Copper line. 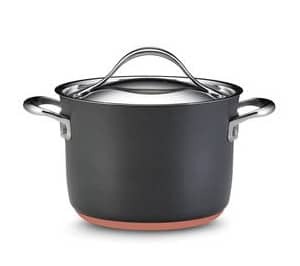 This pan is not only beautiful but also boasts hard anodized construction and a double full cap base comprised of a copper core and layered aluminum, encapsulated in magnetized stainless steel. The metal has excellent heat conduction and makes the pan have a nice heavy feel. The new Autograph® 2 nonstick offers excellent food release and easy cleaning, and is even metal utensil safe! The pan is and handles are also oven safe to 500°F. UPDATE March 2016: Anolon pots and pans do appear to be good quality at first use, but after a few years of inconsistent use, the set I received as payment for this post is complete garbage. Please do not purchase Anolon nonstick pots and pans. They are not metal utensil safe as described, they are not safe at high heat as described, nor do they hold up to everyday cleaning. Furthermore, I do not believe that any nonstick pot or pan is safe to use after 2 – 3 years. I know Calphalon non-stick is just as bad. Please put your money towards quality stainless steel pots and pans or regular cast iron or enameled cast iron. I’m partnering with Anolon for the Anolon Cook & Tell on Facebook. We’re giving away the pot featured in this 4 quart saucepot which is valued at $59.99. You can enter below, or on their facebook page. Included in the giveaway 1 Anolon Nouvelle Copper 4 Quart Covered Saucepot, pictured left. For a chance to win the pan pictured to the left, an Anolon Nouvelle Copper 4 Quart Covered Saucepot, just leave a comment below telling me your favorite fall soup. Heat oven to 350°. Drizzle 1 tablespoon olive oil on butternut squash and sprinkle with 1 teaspoon salt. Place cut side down on cookie sheet. Roast for 30 - 45 minutes (depending on size) or until tender. Drizzle soup pan with 1 tablespoon olive oil. Add carrots and onion to pot with 1 teaspoon salt. Saute until tender. Add coconut milk and vegetable stock. Add curry powder, garam masala and cumin. Add roasted butternut squash. Bring to a boil and reduce to a simmer. Simmer, while breaking up roasted butternut squash for 15 - 20 minutes, or fragrant. Use a submersible blender to smooth soup or add to a blender to smooth. Disclosure: I received several Anolon pots and pans for review purposes. I am diggin this soup! Winter squash is definitely my favorite to enjoy this time of year. This flavor combo is out of this world! Truly a gorgeous soup! Love the colors and flavors. Raw almond butter in the Vitamix + dark chocolate swirls… when the almond butter is still warm, it melts the dark chocolate and you get delicious swirls! What a beautiful color this soup is! I bet it’s delicious, curry and butternut squash really pair so well together. I have some butternut squash and this is calling my name! Love the new Anolon pans, they are really awesome. I love vanilla almond butter, but cashew butter is a close second. There are just too many choices out there. My favorite soup is definitely potato soup, but I don’t know…this one’s looking like it might become my new favorite. I’m so fickle when it comes to soup! I love a good chicken soup this time of the year, that or hot and sour soup! I guess I’m boring, but a crunchy peanut butter does it for me! I will have to go with Almond butter. But i have never tried flaxseed butter or sunflower butter….if i can get my hands on a Blentec though…i will try ever kind of butter on the planet! 🙂 And then i’ll make some KILLER soup with this fabuloso pot! 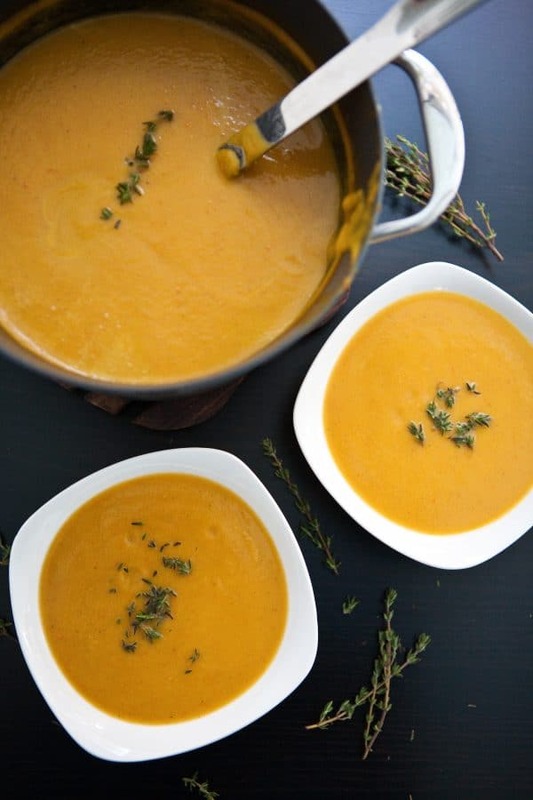 I have two butternut squash sitting in my kitchen right now — so trying this! 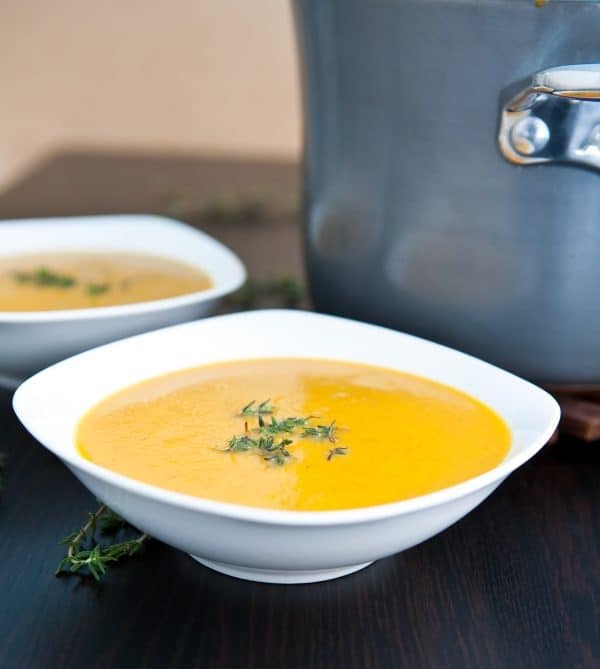 I adore squash soups – part of the reason I love the fall! This is a gorgeous creamy one…. I love Kabocha soup during fall season!!! My favorite nut butter is Almond butter 🙂 yummy! I love Hazelnut butter. Was recently introduced to it but fallen deeply in love with it. Roasted Tomato and Basil Soup! Butternur squash, white bean and chiken sausage soup. Butternut squash, white bean and chicken sausage soup. I had the best cauliflower soup last weekend. I need to re-create it! I love homemade vegtable beef soup. Slow cooked all day to come home and enjoy a bowl full of goodness. This soup sounds right up my alley. And that pot looks great!! I love making homemade chicken noodle soup in the cold months. I also make it for the family of a new baby. It’s easy to freeze and get out later. My favorite soup for the fall, through the winter, is one called “Humphrey’s Beef Barley Soup”. This is out of a book of recipes from Minnesota – This was supposed to have been a favorite of the late VP Hubert H. Humphrey. 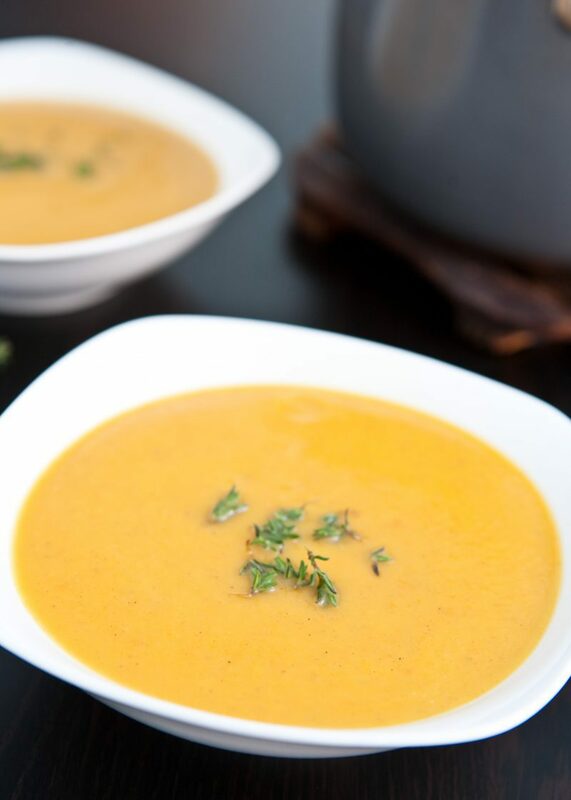 My favorite fall soup is Butternut Squash and Apple Soup!!!! YUM!!!!!!!!!!!!!!! I love soups, but the first cold, dreary fall day requires a big pot of chili. This is a must make, it will jazz up my own recipe. Thanks! This was a very flavourful soup! I added a sweet potato to give it a bit more substance but other than that I stuck to the recipe and really enjoyed it! The other day I was craving soup,specifically one with butternut squash and coconut milk and found your recipe. I have to say this is one of the best soups I’ve even made! This is simple to make and absolutely delicious! I’m sure I’ll be making this many more times this winter! Thank you! 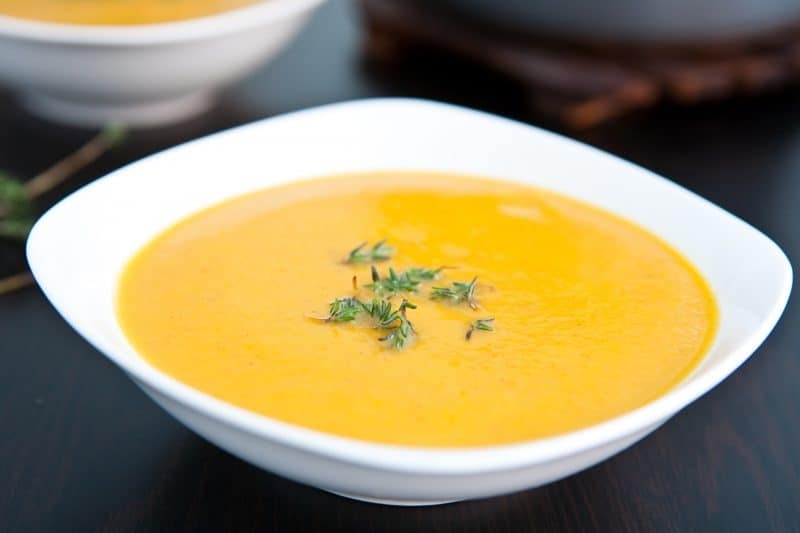 I love butternut squash soup and your looks absolutely delicious!